This is a list of players that grew up in Brazil, but have eventually become naturalized citizens in other nations in order to play with their adopted country's national soccer teams. 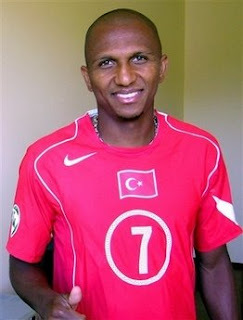 Marco, his pre-Turkish, Brazilian name, moved to Turkey in 2001 at the age of 24 and played with Trabzonspor and Fenerbahçe for a few years before becoming the first naturalized player to be called up to the Turkish National Team. Alex left Brazil at the age of 16 to play high school soccer in Japan between 94-97. He applied for Japanese citizenship in 2001 and a year later was playing for Japan's national team. Eduardo da Silva was noticed by scouts from Dinamo Zagreb in 1999 when he was a 16 year old playing in Brazil. In 2002 Eduardo became a Croatian citizen and he has gone on to be a very important member of the Croatian National Team ever since. Tunisia's dos Santos was discovered as a 17 year old playing in Brazil by Standard Liege in Belgium. He went on to play with North African power Etoile du Sahel in Tunisia between 98-00. dos Santos had hoped to play for Brazil, but when that looked like it wasn't going to happen, he became a naturalized citizen in Tunisia in 2004 and has since scored 22 goals in 39 appearances for the country. "Zinha" started playing in Mexico at 22, in 1998 with Monterrey. After settling into Mexico for a few years with Monterrey and Toluca, he became the first foreign born player to score a goal for the Mexican National Team. Real Madrid's Pepe moved to Portugal from Brazil at the age of 18 in 2001 to play with Maritimo and eventually FC Porto. Pepe became a Portuguese citizen last year and appeared in a couple of Portugal's Euro 2008 qualifiers. Deco moved to Portugal in 1997 at the age of 19 after being picked up by Benfica, who he never actually played with. Having lived in Portugal for six years, in 2002 Deco became a Portuguese citizen and his first international game with Portugal was against, you guessed it, Brazil. Marcos moved to Villareal in Spain at 26 after playing professionally in Brazil for a few years. In 2006 he was granted Spanish citizenship and has since been called up for the Spanish team multiple times. Roger is a very recent addition to the Naturalised Brazilian list, having just become a Polish citizen last month. He moved to Warsaw in 2006 at the age of 23 and was recently fast-tracked into Polish citizenship after being promised a place on the National Team by head coach Leo Beenhakker. "If we don't take care about the invaders from Brazil," he said, "then at the next World Cups, in 2014 and 2018, out of the 32 teams you will still have national teams, but we will have 16 full of Brazilian players." Doesn't it defeat the purpose of international soccer to have so many Brazilians on foreign national teams? When a player can move abroad in their late teens/early twenties and play for another country just a couple of years later, there seems to be something wrong with the system. What's your take on the "Naturalized" Brazilian trend? It is lame. I don't have a problem with it if they have been living in their adopted nation long enough, but only a few years is ridiculous. It should be like ten years or something significant. Perhaps FIFA should host two tournaments the traditional "National" team World Cup and a "Naturalized" Team World Cup ( of far lesser significance and support) out of "Fairness" to those countries that do not promote and exploit this loophole. I say this having (for only one example) viewed the recent 2010 Cup match Germany vs. Australia (an albeit an obviously superior German side) but take away 3 of their best "Naturalized" (scoring) players(2 Pols and a Brazilian)and you have a 1 goal game? Food for thought! it is so good that everybody plays for his own national team or even i believe that to his own ethnic because it's not a club it is representative of a nation, so not even Brazilians , players like Khedira,Ozil,Campbell,Zidane,Henry,Defoe,Vieira and many others! it would be cool if Zidane played for Algeria and it would be cool David Costa played for Colombia or it is good that George Weah played for his own country in spite of being a weak team,Liberia!